During half term why not pop up to the GSPCA Animal Shelter between 10.30am and 4.30pm for a drink, snacks, see some of the animals at the Shelter and browse our new and donated goods on sale. Did you know we now have an online shop? Click here to visit it. We have many animals looking for homes and some of the hamsters, rabbits, birds and maybe even a ferret or two will be in the room for visitors to see. 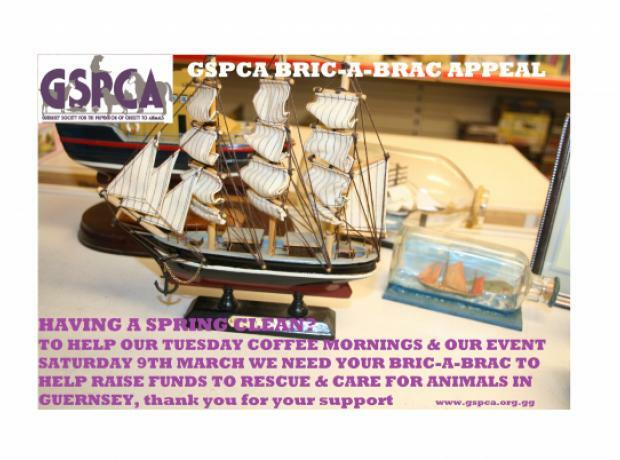 The GSPCA would like to thank everyone that has been supporting our Tuesday bric-a-brac and coffee mornings as well as our open days. So we can continue doing these at the Shelter and to help with other events we are appealing for additional bric-a-brac, games, books, clothes and other charity shop items to help raise funds to help rescue and care for animals in Guernsey. Many of us are having a Spring clean so when you do yours please think of the Animal Shelter and how your unwanted items can make a difference to animals lives.